We suggest keeping as much data about users, including contact details, position, department etc. in G Suite. 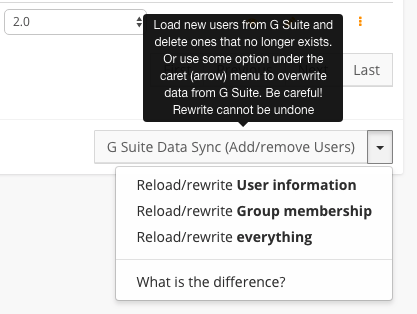 You can very simply synchronize the user database from there to SignatureSatori, however, it doesn’t work both ways - you can’t synchronize data stored in our app to G Suite. If you use Custom categories in G Suite, we also offer an option to map them to Custom fields in SignatureSatori - we have a dedicated article about that, Advanced field mapping. When you install the app, the users from G Suite will be automatically imported to SignatureSatori. If you want to perform the synchronization after the initial import, please read the following carefully. The synchronization starts in the Users menu, below the list of users.